At this time there are many ICO's hitting the market. We are aware of many gaming cryptocurrencies that are made day by day. However, there are only a few worth mentioning, only a few who are able to make some difference in the gaming industry. Yet even those are just 'able'. Some of them are already out, but as game enthusiasts, we do not see any change in the gaming world. ULTI Coin is here to really make an impact and to do something that everyone will be able to use in real life. We are here to make a difference, to approach the same market from a different perspective. Here is how we differ from other gaming crypto-coins. Unlike many other projects that make their own games with their own gaming crypto-coins, we do not. We are gamers, developers and crypto-enthusiasts. We leave game making to people who are good at it. Our job is to implement our platform with games that everyone is already playing. Nobody wants to play an average game to make some profit. No, we want people to play their favorite games, from their favorite developers and make the profit out of that. Many successful ICO's asked other companies to buy their token, to implement their games. ULTI Coin is different. We give our tokens to companies for free. The way we profit from it is by taking a legal fee for every transaction. In that way, every company is very cooperative. Our goal is to get implemented in as many companies and games as possible. For gamers: You don't have to pay anything to use ULTI Coin. Once we finish ICO we give our platform for everyone to download for free. By using it you collect in-game currency which u can sell for ULTI - gaming cryptocurrency. You can exchange ULTI for fiat directly on the platform, or crypto-exchanges that adopted us, whichever you prefer. For gaming companies: By implementing ULTI Coin to your games you will get the percentage of every coin that players sell from your own games. To be more clear - every time a player exchanges a coin from your game for ULTI you get a percentage. The percentage varies from the contract you make with our company during the implementation. Also, you will get a higher player base in every game that you implement, which leads to greater profit overall. 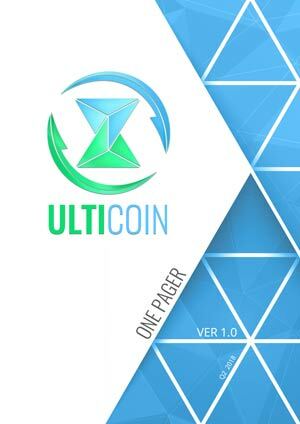 ULTI Coin can be implemented in ANY game. Literally any. It doesn't matter which gaming platform. We cover everything: PC (Windows, Linux), Playstation, Xbox, Nintendo, Mobile. Anything that was and that will ever be made. This is the first time in history that people will be able to play their favorite games and make real life money. How it works? Play your game - earn in-game currency - exchange it for ULTI - exchange it for real money, crypto, or any other in-game currency...the choice is yours. There has never been something that made that available. Yes, there are professional gamers who make money by gaming, but they are just a few. Yes, there are black markets for item trading in certain games, but they are not legal, and most important - they are not safe. Ulti is here to change all that. ULTI Coin allows everyone to profit from their time spent in a game. Regardless if you are a pro or a casual gamer. No more black markets, no more scams, legal and safe.